YARDAGE is centered around labor, consumption, and waste, specifically on how these factors interface in the context of globalization. The things we use daily, that we put in our homes, that we wear, are predominantly manufactured in other places, where labor is cheap and working conditions are under-regulated, if at all. There is a life cycle to these cheaply made goods. We buy more and more because the price point is low enough to allow it. Instead of shopping to meet our needs, we switch focus to meet our ever growing wants. The more that we buy, the more that we have access to cheaply, the more we want, then we buy more. In this model goods maintain their usefulness for a shorter duration as they are easily and cheaply replaced by new, seemingly better goods. The majority of these cheaply made goods become fodder for landfills. In the US each person generates approximately 82 pounds of textile waste each year, From this waste around 12 pounds gets donated or recycled, leaving 70 pounds to go to the land fill. Within the working class your labor is your value, your labor is your identity. As production of goods has shifted, it has challenged people's identities and communities, Where the labor has moved to, people's identities have changed, generally moving people from agrarian communities into cramped urban areas, from farmers to factory workers. Where labor has moved from many people have lost their identities with their jobs, and communities have struggled to redefine themselves. Manufacturing has moved to new under-regulated geographies that are prone to unsafe working conditions, forced labor, child labor, and poor wages. During YARDAGE, people are invited to donate their used clothing to Goodwill of Greater Grand Rapids, the exhibition sponsor, who will sort out items for reuse. Clothing that has passed through the first re-use cycle will be gleaned for use in the project. The clothing will be disassembled and the raw material, fabric, will be cut into uniform width pieces that will then be sewn into a new bolts of fabric. People will be able to sign up to volunteer to process and sew the fabric back together. This is a deconstruction and reconstruction both of the physical textile and the labor used to make it, a gesture acknowledging the greater value of both than evidenced in the original cheaply made goods. The new fabric being produced will be wound back onto bolts, marking each day's production. 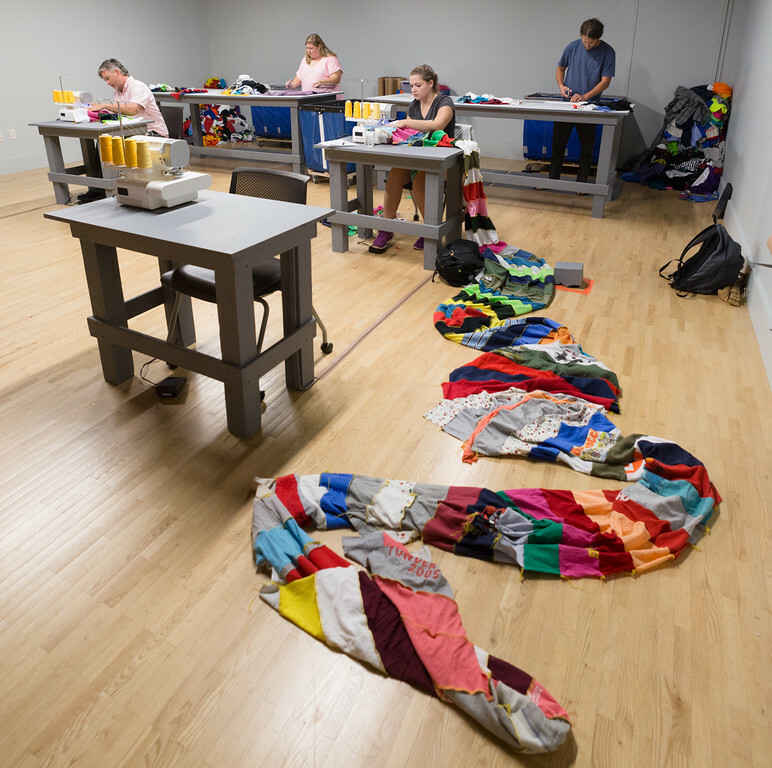 Working with KCAD's Gayle DeBruyen, Chair of Collaborative Design, all cotton fabric scraps generated during the process were composted. 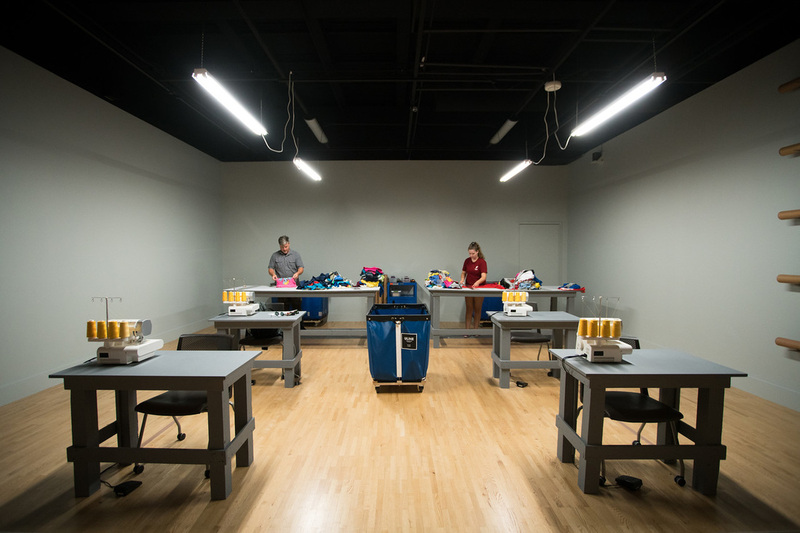 Prior to project start, working with KCAD's Lori Faulkner, Chair of Fashion Studies, and her Sustainable Fashion course we produced a bolt of re-purposed fabric. The student used the fabric to create unique Zero-Waste Designs. All videos and photos by Matt Gubancsik courtesy of Kendall College of Art and Design of Ferris State University.